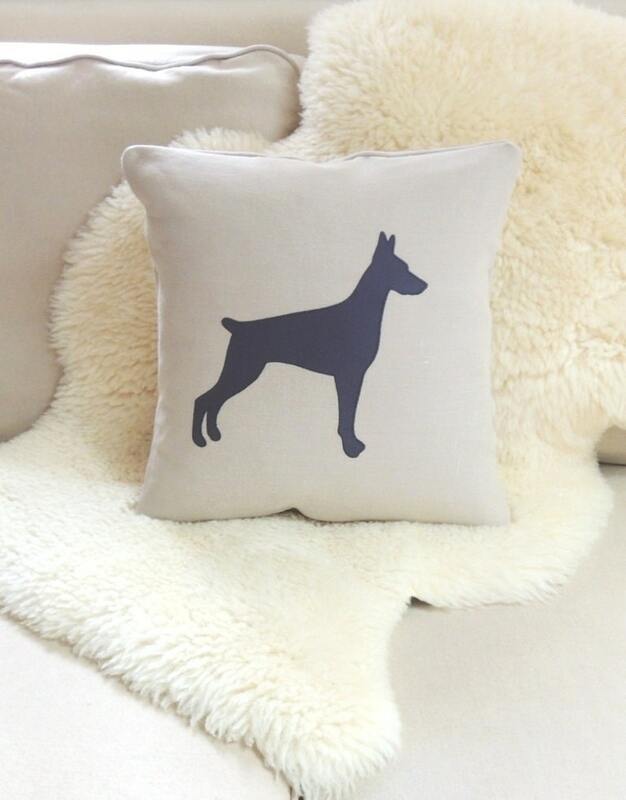 This Doberman Pinscher appliqué pillow cover celebrates your loyal sidekick and adds a chic layer to your interior space in flax beige linen and dark charcoal gray. This dapper pup looks fetching on a sofa, in a chair, propped on a bed, greeting your guests on an entryway bench or anywhere else you can imagine. Customize the Doberman silhouette in classic black, white, ivory or navy blue. The inspiration...I've had a thing for Dobermans ever since watching Magnum P.I. episodes. Zeus and Apollo were stars! So this design is in tribute to "The Lads" as Higgins so affectionately called them. Doberman Pinscher Dog Pillow Cover © Vixen Goods. All rights reserved. I just received the Doberman pillow cover today, and it's perfect for our baby's nursery! The fabric and workmanship are beautiful. Thank you so much!